I am a 4th year student studying a Bachelor of Education (Primary) Degree. I am writing to you about being a recipient of the New Colombo Mobility Scholarship, which I received earlier in this year in April/May. This scholarship was initiated by the federal government, in which the government allocates money and funding towards tertiary education students studying an in an undergraduate degree at a recognised Australian university. A week later I had received an exciting email from Judith Miller, the Deputy Head of School in Education. I was informed that I had been accepted to be one of the 6 students who would be travelling to Bhutan to live for three weeks. I couldn’t believe it! I had never received such good news before, I was actually in shock. I had never been given such an amazing opportunity before. I couldn’t believe that I was going overseas to experience another culture and nationality. I had never been on a plane before and had never left the country, only having travelled to Queensland as the furthest trip away from Grafton, NSW, which I call home. I believe that being a recipient of this scholarship has changed me as a person. It has truly opened up my eyes and the way that I now look at the world, particularly after living amongst a Buddhist community and experiencing a different way of life for three weeks. The lifestyle and socio-cultural aspects of Bhutan and the religion of buddhism has definitely changed my outlook on life, my spiritual well-being and also the way that I treat and view others around me. Further, in relation to the education side of the scholarship program, it was such an honour and amazing experience, living on campus at the Paro University, at the College of Education guesthouse. For the first week of the program, the other Australian students and I attended classes at the university. These classes ranged from mathematics to english and science. Attending these classes was such a fun experience and allowed me to gain a valuable insight into how the structure and routine of the university worked in Paro, Bhutan. This university was highly regarded and most of the local teachers at Khangkgu Public School had attended this university to study teaching and education. In relation to the topic of education, the second week of our trip consisted of us Australian education students completing a week’s teaching and learning at Khangkhu Public School. During this week of teaching, learning and observing the ways and features of the Bhutanese education system was terrific. I learned so much and furthermore I was fortunate enough to be able to teach a few lessons to the year 3, 4 and 2 classes. I formed a great friendship and rapport with my supervising teacher Dawa Zhangmo, who was a lady with excellent interpersonal skills and a great teacher. I was also fortunate enough to be involved in some extra-curricular activities such as playing sport and doing some drama work with the local students. I was so impressed and happy to be at the school that I met the principal and made a small donation to the school for the purchase of some additional teaching resources and supplies for the students. I was so grateful that he accepted my small offering that it made me feel extremely happy. As you can gather I was overjoyed with the experiences, memories and friendships I had made during my time there. Attending a school in a country with less-wealth and resources than Australia, made me realise how lucky and privileged we are in Australia, in terms of our accessibility to education and resources, to improve our circumstances and way of life. After working and teaching in Bhutan, I believe this experience has benefits for both my professional career and teaching pedagogies, while improving my personal ideas and philosophies on teaching, learning, friendships and way of life. However, the trip wasn’t all about school based education. There were some great social and cultural experiences had, and a very notable one for me was trekking to the “Tigers Nest” temple. This trek was spectacular, yet quite physically challenging, climbing to an elevation of around 3500-4000 metres above sea level. This climb was one of the hardest physical-tasks I have done in my life and it was difficult to breathe at that height. It took a few hours to reach the top, but the trek up was well worth the views of the picturesque, rolling mountains and valleys. Near to end of the trail the view of the TakSung Temple was also exceptional, providing some amazing photo opportunities. We were able to visit the Temple and go inside thevarious prayer rooms and chambers, while climbing down into the darkness of the sacred tigers nest cave, where the original, mythical tiger was said to inhabit. Our last week of living in Bhutan involved the six students and two UNE lecturers, namely, Judy and John, jumping into a Toyota van and setting out on a cultural tour across the neighbouring towns and regions of Bhutan. This cultural tour included cities such as Thimpu, and the regions of Punakha and Bhumtang was marvellous and was well worth the bumpy and unforgiving ride in the van. As a group, we were able to visit some beautiful sites and experience some exceptional scenery and landscapes. 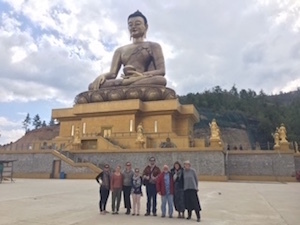 These experiences were so lovely, as it allowed me to view the beauty of the natural Bhutanese landscape while learning about the history and rich characteristics of the many sacred and culturally-significant sites, buildings and areas. The cultural tour also provided for some exciting adventures and experiences to be had. This included some more trekking to significant temples, meeting new local people and enhancing our knowledge of the local landscape, culture, religion and traditions. The fairly tame white water rafting was a great experience also, as I had never attempted anything like that that before! These experiences were so amazing and I will definitely cherish them for the rest of my life. I would just like to say thank you to our UNE lecturers Judy Miller, John Haynes, the Australian government, the University of New England and the many others who helped make my trip a reality and such a memorable, rewarding experience. I would also like to say thank you to the other students who attended the trip with me, Ella, Alanna, Brooke, Emma and Kahleea. In finishing I hope I have provided a brief insight into the scholarship program, the amazing opportunities it presents the positive and long-lasting effects of the program and the cultural, social and religious features of the Kingdom of Bhutan. Today it is my pleasure to provide a report about my recent trip to Bhutan whilst on a New Colombo study plan scholarship. A short while ago I was posed the question … “What did a scholarship to Bhutan mean to you?” With the cameras rolling I was asked this question by Associate Professor Judy Miller, whilst having a break, on a 3000 meter mountain on the way to Taktsang (Tigers nest) monastery at Paro. My reaction to this same question today is “thankfully I have had more time to think about it.” To be incredibly honest every time I think about my experience in Bhutan I find new insights. The light I can shed with you today is my experience from the perspective of now, had you asked me in May as we landed back in Australia my answer no doubt what have been completely different as I’m sure it would have been in years gone by. It was an absolute whirlwind three week tour. The magnificent views alone from our dormitory bedrooms were beyond comprehension, including the Paro river, the magnificent structure of Paro Dzong, in a setting of traditional houses and farmland. It was more than the guaranteed cultural immersion. We were well and truly thrown in the deep end, but in a good way. Following a four hour sleepy flight from Bangkok, we bounced off the plane at Paro on April 18th, after seven exciting minutes of Himalayan mountain-dodging, and quite literally dropping out of the sky onto the airstrip we were certainly awake. Following a quick exchange of dollars into ngultrums, we were bundled into cars and headed off down the short bumpy road towards the college where we were greeted with tea, and a brief lesson in need-toknow words in Dzonka to get us through the day. Before we knew it we were in town, and swallowed by the bright buildings, one special eye-catcher was bright fabric of the fabric store; and I mean here I was really swallowed. I’ve never seen anything like that in my life, there were three rooms lined from floor-to-ceiling with reams of incredibly vivid fabric. Of note, in the ensuing days I soon became very familiar with the fabric store-owners. But back to the story, in a few moments we were all measured up and fitted with traditional clothing, and upon reentering the light outside the store we were dressed in kira’s and jackets and our male colleague, Dylan was dressed in a gho. Then it was off to discover the delights of the local food markets. All of this happened before lunch! So it was momo’s for lunch (a traditional dumpling) and a Bhutanese feast for dinner. It was at this Alumni dinner, arranged by UNE Alumni member Dr Kezang Sherab from Paro College, that we learned ‘seconds’ are not optional neither is eating less than a kilo of rice at every meal. 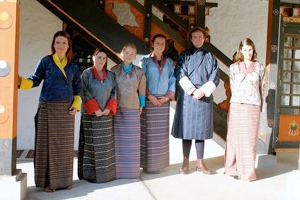 A New Colombo Plan scholarship to a country in the Asia-Pacific is one thing, but a trip to Bhutan is a totally different experience. Prior to departure we were told it would be a life changing experience, and nothing else would compare. Having been a very keen traveller to India and Nepal in the past, and with a great interest in Asia, I was sure there may be some similarities. I was very quickly shown this was not the case, and indeed it was life changing. The entire experiences was all-encompassing and almost too much to handle for my 22 years of age self. As such that whenever there was a moment of silence I would yell at the top of my voice “We are in Bhutan” the feeling was almost unbelievable. The most influential aspect of the trip included the encounters with the Bhutanese people and their desire to protect their culture and extend the country’s message of Gross National Happiness. I could not believe, and the thing that shocked me the most was the eagerness of the people to learn, and although on a different scale we all had something in common that was to improve education, to better ourselves and learn new things about each other. I learned from talking to so many people of different ages and also having in-depth conversations with some of the most esteemed lecturers from our own University to the point I consider our own Deputy Head of the School of Education to be a dear friend, which is a very strange concept I’m sure for the majority of undergraduates at any university, but I may have even taught her a few new tricks. The trip definitely cemented with me that we all start somewhere and whether that’s walking two hours through the mountains of Paro to attend school or catching a bus to school in southern New South Wales. So what did it mean to for me? It meant I came home with some of the most gorgeous fabrics, a bag full to the brim of wonderful memories, very new, distinctive, special friends, a wonderful insight into making the most of opportunities, learned parts of a new language, got to see inside a different approach to schooling, was able to teach children who spoke a completely different language and I have an insight into a part of a world that people rarely get to see. A part of the happiest place on earth. When asked if I would recommend Bhutan to anyone, I said “no, not anyone.” The new Colombo plan to Bhutan is not for anyone and everyone is for certain people, it’s an amazing place. 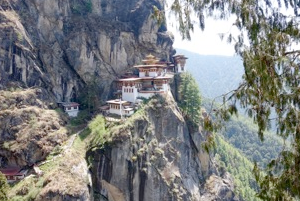 It’s not for bus loads of people, it is to be respected and cherished and the people of Bhutan have succeeded in keeping this hidden treasure in its natural state whilst developing themselves as a country. UNE accompanying lecturer’s Dr John Haynes and Assoc Prof. Judy Miller, and a nice coincidental meeting with Dr Margaret Brooks (UNE) definitely contributed to the success of the trip. Wonderful friendships had already been established by these people in previous visits, so much so that when we arrived it felt like meeting a long lost family. Paro college lecturer Dr Lungten Wangdi and his teacher-wife Sangay Wangmo looked after us like they had just adopted six new children. Both John and Judy have a wealth of knowledge and incredible stories about Bhutan that added to the entire atmosphere. I’ll be forever grateful to be chosen as a scholarship recipient of the New Columbo Plan, but I am even more grateful the UNE chose Bhutan as the destination.